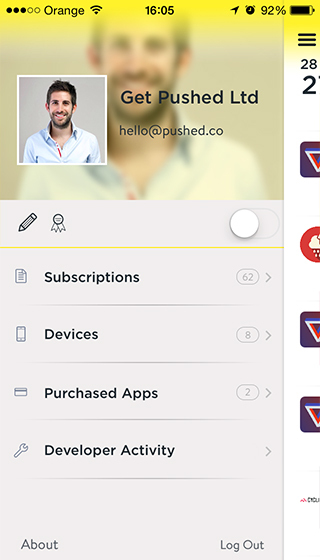 Pushed is the personal notification center. 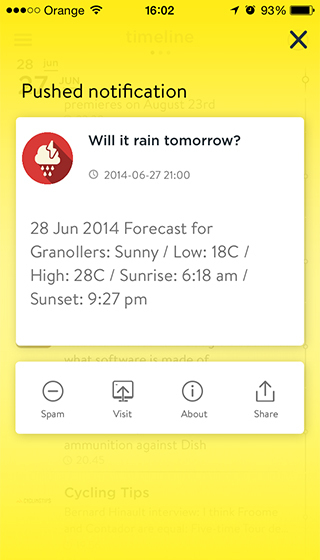 It allows you to receive notifications when something important happens. Wait... but, what is something important? Everything! Pushed is an open platform where developers or companies (no matter the size of them) can build new awesome services. We had a vision: to change the way that people interacts with the information. We found ourselves wasting our time in many ocasions because how things are built. In the internet world, there are so many things that can be connected but they are not, at least not the way we wanted. We started Pushed to change this by pushing all the information that matters to the user creating interesting connections between services around the world. For example: we were very tired of checking again and again the status of a shipment through the delivery agency site, so one of the applications available on Pushed are different shipment tracking systems that sends you a notification every time there is a change. That is how we came up with our tagline: Be notified when it happens. The aim of Pushed is to connect everything to you. We want to change the way users consume information by reversing the process: stop pulling and start sending push notifications! The mobile application consists on multiple apps and channels where you can subscribe. You can also unsubscribe any time you want. We have created a few of to show you how powerful Pushed is: discover them now! The Client Applications: iOs App, Android App and the Website . To start using Pushed you just have to signup by downloading our iOs or Android application or through our webclient. We call this parts the Pushed Clients, as they consume all the information and provide Pushed service. With the Pushed Clients (mobile applications and website) you can follow services you are interested in and subscribe to them (we named it apps). Pushed will automatically send you a notification every time there is a new update from that application. You can also share notifications you like to your friends on Twitter and Facebook. Imagine a news site: they produce a lot of information, and you are only interested in sports. Well, channels are the answer to this problem. The publisher can create several channels pointing to different news source: international, sports, science, etc... and you can subscribe to specific channels you like. Aren’t you tired of keep looking your shipment status? Pushed offers several tracking applications in which you can track your shipments so you don’t have to constantly check the status. TV Alert Show, an app that sends notifications when there's a new episode available of your selected show; or GitHub Notifications, an app that connects to GitHub through OAuth and serves you all the notifications related to your GitHub account. And this is only the beginning. Imagine what Pushed can do for you: it is a lot! All the magic happens in our API. 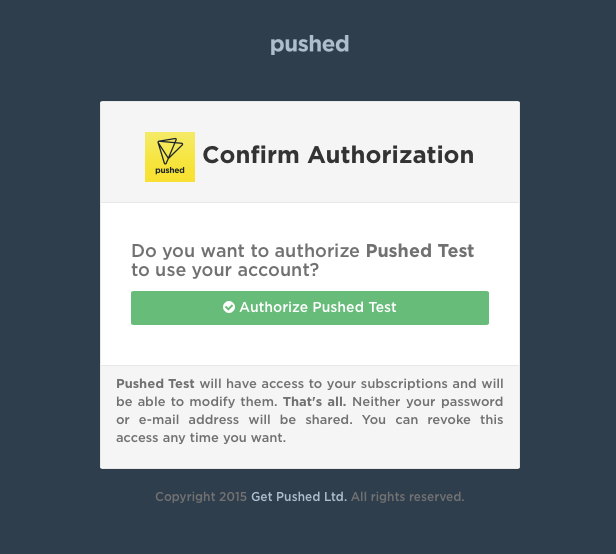 Pushed has build a powerful set of tools for developers so they can send push notifications very easy. Are you a developer? You are very welcome in Pushed! You don't need to buid your own app. Pushed offers a Developer Panel to manage your notifications and get complete analytics. No coding required! For further and more complex integrations we provide a Public API to incorporate Pushed in your business workflow. In the Pushed Developer Panel you can make your own Push app and start sending push notifications. For developers we provide an API so you can intergrate Push in your site or app. In Pushed we want to build a service anyone can use, from developers to people with no deep computer knowledge. So this is why we came up with the idea of Pushed ID. Pushed ID is a unique identifier encoded in a Bidi code that allows you to connect to multiple services in multiple ways without the need to write a single line of code. Using Pushed ID you can for example, make custom integrations without the need of typing codes or complex workflows. Pushed service targets different roles of users: subscribers (users that explicitly request getting push notfications) and creators (users that creates notifications). Creators, named in Pushed vocabulary as developers are the one responsible for the Push notifications sent to the clients using the different clients, iOs, Android and Website. Register in Pushed by clicking here . You will receive shortly an email with an activation link. Please click the activation link to confirm your email address and enable your account to send push notifications. As part of the review process, we may be contacting you to verify the information you submitted. Now you are ready to send notifications with Pushed. Access the control panel to set up a new application. Open the Apps section in the top navigation bar. Click on Create your first app now, you only have to set up a new name and a descriptionfor your app. Once the app is created you will be redirected to the app settings page. By default, all new apps are private, it means that only people with the subscription link can subscribe. If you want to make it public you just have to switch the Public toggle. There are different ways to test and send your firsts notifications. Of course, to receive notifications first you have to subscribe to your recently created app, to do so you need the Pushed app (available for iOs and Android). We recommend using the mobile app download here , because you will be able to see how notifications and application works, but you can also use the site timeline to check them. Of course you can also start using our API, but that is one step further and requires coding skills, find here more information about using Pushed API. To subscribe to your recently created app open the Pushed mobile app tap on the icon. This will open the search view, to make it simple, tap on the and scan the code provided in the app settings page . Once you have scanned the code, a confirmation message will appear saying that you have successfully subscribed to the application. Now you are ready to send your first notification. Back on app settings page , click on Notifications and then New Notification. A modal window will appear asking for the notification details: content and target. If you followed this guide step by step, at this point you will only have one app created that will be preselected by default, so you only have to insert the notification content and click Send Notification. That's all! The notification will be queued and in a matter of seconds you will receive it in all your devices. Remember that you can download Pushed and set up your account in as many devices as you want. In order to build interesting services, push notification shipments must be done programatically. There is where Pushed is extremely useful. Integrations can be done in any third-party system, as Pushed works everywhere, because it does not depends on any library. OAuth2 is a protocol that lets external apps request authorization to private details in a user’s Pushed account without getting their password. This is preferred over Basic Authentication because tokens can be limited to specific types of data, and can be revoked by users at any time. Pushed implements OAuth2 to allow external applications send notifications to users. The protocol request authorization to users so Pushed applications can send notifications directly without getting their password. Remember that users can subscribe to your applications without the need to implement OAuth. OAuth is only recommended for applications that needs to send different information to each user. And if you open the Authorization Link with a valid redirect URL as a parameter, you will find this view . This starts the OAuth 2.0 authorization flow. This isn't an API call, it's the web page that lets the user sign in to Pushed and authorize your app. After the user decides whether or not to authorize your app, they will be redirected to the URI specified by redirect_uri. You must specify the redirect_uri parameter to the auhtorization link so Pushed can callback the specified URI with authorization details response. The client_id corresponds to your app_key. You can find your app_key in the Settings section of your application in Pushed's Developer Portal. Note that each of your applications have its own and unique app_key. Important Notice: If you don't provide redirect_uri you will get an Invalid Authorization Link error. Pushed redirects back to your site: If the user accepts your request, Pushed redirects back to your site with a temporary access_token in a code parameter as well as the state you provided in the previous step in a state parameter. If the states don’t match, the request has been created by a third party and the process should be aborted. Exchange this for an access token: Now you must exchange the code parameter for an access_token using the oauth/access_token API endpoint. "message": "Authorization Code is valid." 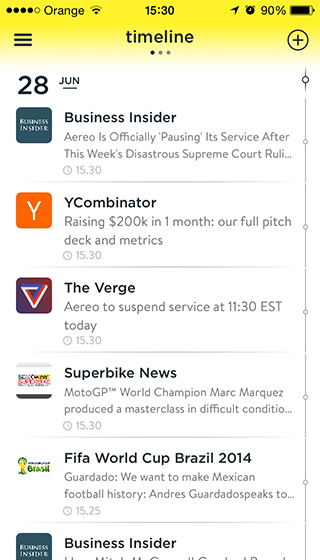 app Send a notification to all subscribers of an app. channel Send a notification to all subscribers of a channel. user Send a notification to an specific user specifying user alias. pushed_id Send a notification to an specific user specifying Pushed ID. New Subscription Any time a users subscribes to your app or channel. 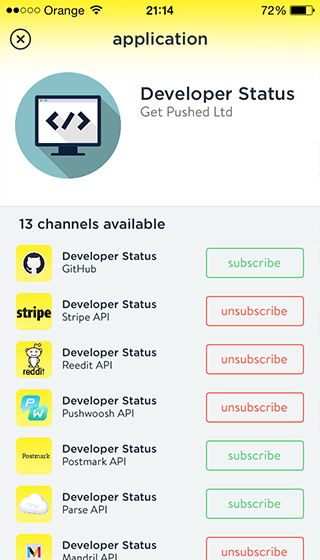 Unsubscription Any time a users unsubscribes from your app or channel. X-Pushed-Event Name of the event that triggered this delivery. X-Pushed-Delivery Unique ID for this delivery. Also, the User-Agent for the requests will have the prefix Pushed-Hookshot/. To setup new webhooks you only have to got the Webhooks section in your app profile in the Control Panel and specify a valid URL to post the data. Each time you send a push notification a Shipment is created. A shipment can be a group of notifications or a single notification. Shipments is the way that Pushed manages the sending, so you can track it globally. In the Control Panel , every one of your apps has a list of shipments where you can review the analytics of every shipment. In order to optimize server resources, notifications will not be stored neither sent if there are not subscribers. That means that notifications sent to applications or channels with no subscribers will not be visible in the control panel. 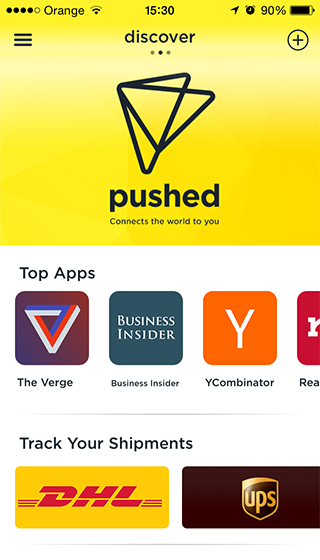 Pushed allows you to easily track your users engagement and acccess to who, when and how many times your notifications are being opened and shared. You can review this information in the shipments page of your Pushed app/channel. Each time you send a push notification a Shipment is created. A shipment can be a group of notifications or a single notification. Shipments is the way that Pushed manages the sending, so you can track it globally. In the Control Panel , every one of your apps has a list of shipments where you can review the analytics of every shipment. This is a premium feature, you will need a paid account to schedule notifications. Pushed offers out of the box QR Subscriptions Codes so you can embed and share it on your site. This way your audience can easily subscribe to your applications and channels incredibly fast. QR Subscription codes can be found on your app/channel settings page. Pushed notifications allows multiple content options: attach links, images/videos that will be properly displayed on Pushed clients. At this time, rich content notifications are only allowed through API.